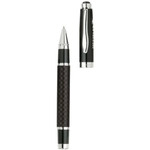 The Bettoni Collection from ePromos offers a number of high-quality promotional pens. These lavish pens exude an air of elegance, which makes them perfect for honoring employee accomplishments or thanking important clients. Their high caliber makes them ideal for the upper levels of a tiered-gifting program. With your logo imprinted on the pens, your recipients will be sure to remember you every time they use them.